●GLP Series High Speed Automatic Bottle Unscrambler is one member of our plastic bottle packing line. It has high speed, suitability to other machines and is able to supply bottles to two producing lines simultaneously through two separate conveyors. ●The machine is based upon the most advanced technology and techniques, supplying bottles fast and stably. For various sizes of bottles users may only need to change the bottle unscrambling plate (if the bottle sizes are not of much difference, no need to change) and adjust the bottle supplying lane. ●The machine has a container that can store 4000 (Φ40 X 75 60ml) plastic bottles inside. Users may also supply the container with bottles using an escalating system according to the number of bottles inside the container. A photoelectric sensor detects the bottle storage and feeds the bottle automatically into the container as settings made by the user. ●The machine is easy to operate and it has PLC controlling system for the whole working process. 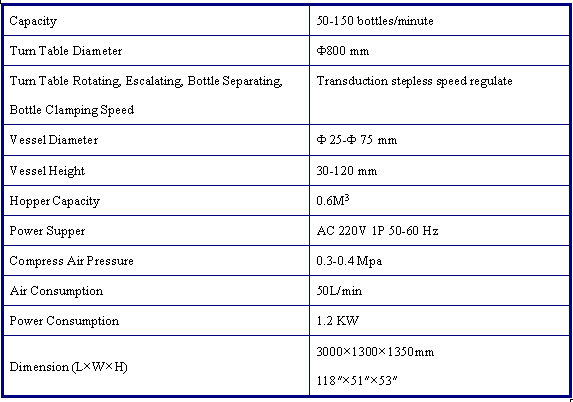 Looking for ideal Automatic Bottle Feeder Manufacturer & supplier ? We have a wide selection at great prices to help you get creative. All the Automatic Bottle Unscrambler are quality guaranteed. We are China Origin Factory of Automatic Bottle Conveyor. If you have any question, please feel free to contact us.